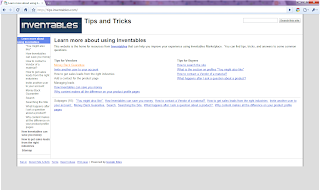 Our goal with the site is to provide all sorts of information to help buyers and vendors get the most out of using Inventables Materials Marketplace. Since it's not practical to meet with thousands of buyers and vendors we're going to attempt to offer up tips, tricks, and answers to common questions through this new website. Our intention is to do this in a personal, easy to understand format. At the bottom of each article you'll see the name of the person that wrote it sometimes accompanied by their picture. We hope this touch will help people get to know our team here at Inventables and remind you that our site is run by a team of committed people not a faceless corporation. We're using a vanilla template and the CMS provided in Google Sites which makes it easy for us to add, edit, and delete information without needing our software engineering team's time. Right now we've got 8 new articles up on the site. If there is a topic you're interested in let us know. We'll be updating it regularly so check back often.